Sometimes, summer just gets way too hot to cook dinner with the stove or oven. I mean really, who wants to stand in a sweltering kitchen at the end of a long day when it’s practically 90 degrees outside? The best way to fill my belly and stay cool is with a salad. 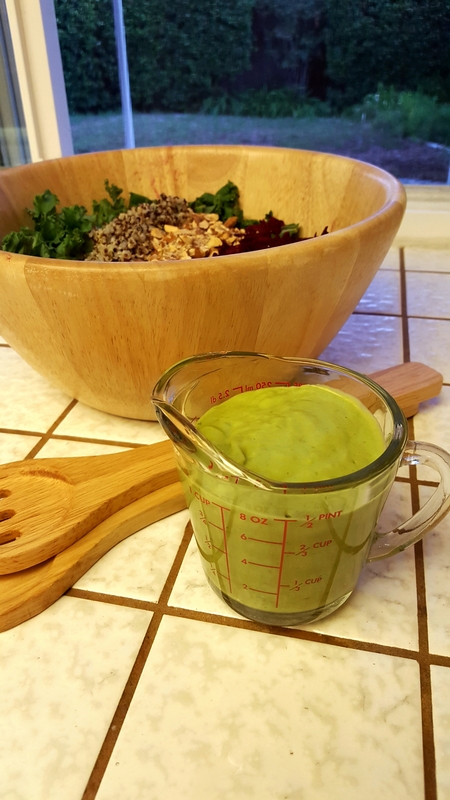 One of my favorite salad dressings is called Green Goddess dressing. It’s got a lot of variations, but in general it has an avocado base, giving the salad a healthy (and tasty!) dose of vitamin E and Omega 3s. And guess what? Avocados are in season! Eating seasonally means choosing to buy and consume produce that is harvested in the season you buy them. This reduces environmental impact (produce eaten in season is more likely to have been harvested locally, or at least in the same hemisphere), and the produce tends to be cheaper, fresher, tastier, and richer in nutrients. So, for this salad, I decided to keep with the seasonal theme rooted in the avocado and chose a few other nutrient-rich summer ingredients. In the end, I realized all of my ingredients were plant-based, making this salad vegan as an added plus for all you hippies out there! Kale is truly a power leaf. It is rich in vitamins A, C, and K as well as fiber and multiple minerals. 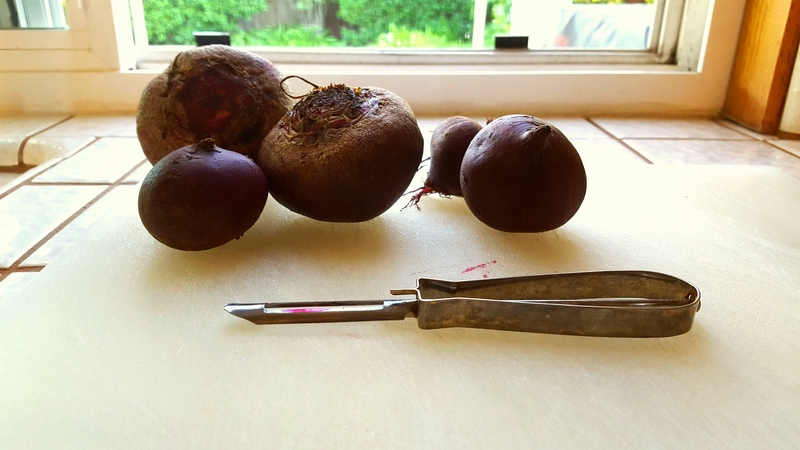 Beets are packed with nutrients as well. They are very high in folates (important for DNA synthesis and repair) and manganese (essential for the production of the antioxidant superoxide dismutase), as well as potassium, fiber, and a host of other nutrients. Almonds serve as the main source of protein in this salad, but also provide additional Omega 3s as well as vitamin E, biotin, and a myriad of other vitamins and minerals. While quinoa isn’t necessarily “in season,” it ties together this power salad as a whole grain that doubles as an additional protein source. Fun fact: quinoa is the only non-animal source of complete protein (it contains all of the amino acids!) in addition to being a source of manganese, copper, phosphorous, magnesium.. the list goes on. Basically, if you’re going to just eat salad for dinner after a long summer day, make this your go-to recipe. Let’s get started with the Green Goddess dressing. I adapted a recipe from Kara Lydon, R.D. by substituting additional basil for the parsley and additional chives for the scallions to keep the cost down, and used a bit more water to improve the consistency. This recipe makes a lot, but it’s delicious and stays fresh for up to a week in the refrigerator. 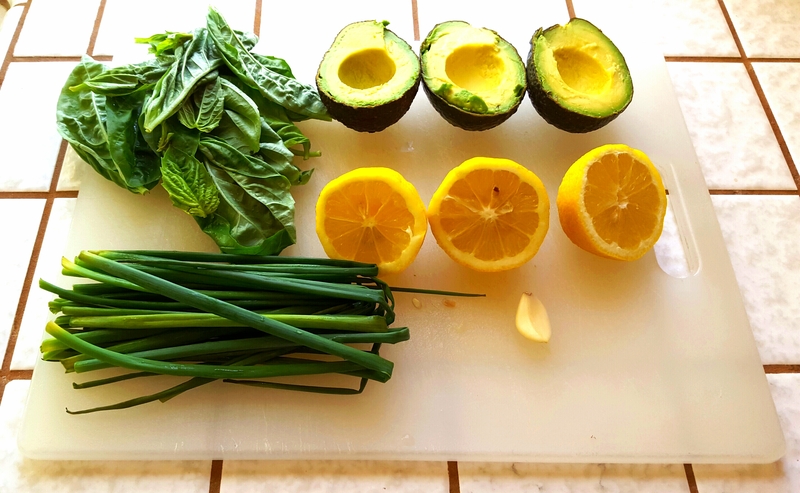 I simply threw all the above ingredients (1 c fresh basil, about 3/4 c fresh chives, 1.5 avocados, the juice of 1.5 lemons, 1 clove of garlic) in a blender with 5 tablespoons EVOO, 1/2 c water, 2 tablespoons apple cider vinegar, 1/2 teaspoon salt, and 1 tablespoon honey, and pulsed away until it was all smooth. I then stored it in the fridge until I needed it. Now, on to the actual salad. Being home in California for the summer, I was charged with the duty of making my family dinner, so this salad is big enough for 4-5 servings. You can either follow the recipe as is and share it or use it as lunch for the rest of the week, or check out the recipe at the end of this post for an individual serving. Since I didn’t have any cold leftover quinoa in my fridge, I set out to make myself some extra to use for the week according to the directions on the package… yeah, yeah OK I used the stove, but now I can use more quinoa for lunch tomorrow without cooking! 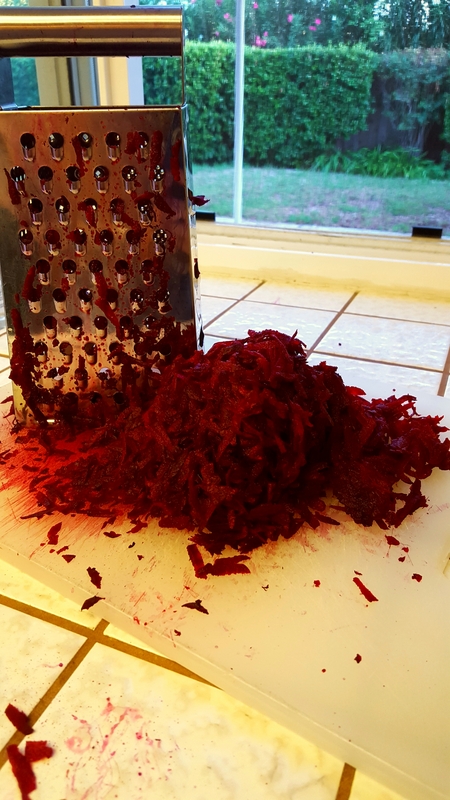 Since I found a pretty cheap bag of pre-washed-and-chopped kale (thank you Trader Joe’s), the only other ingredient I really needed to break down was the beets. 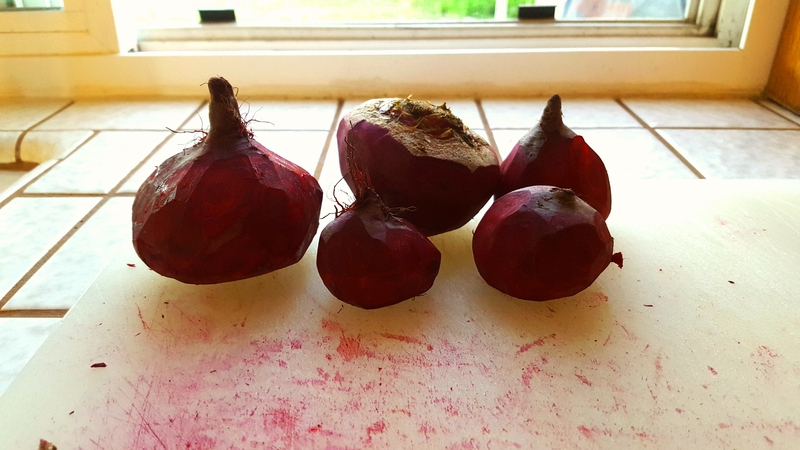 I used about 1 lb of raw beets. They are beautiful raw: light, fresh and sweet. So anyways, I first peeled the purple roots, leaving one end unpeeled so I could grip it while shredding. Don’t they look like funny little men with hats?? Oh yeah, beets stain. Be prepared to clean purple off everything they touch. I then proceeded to shred the little guys with a cheese grater. 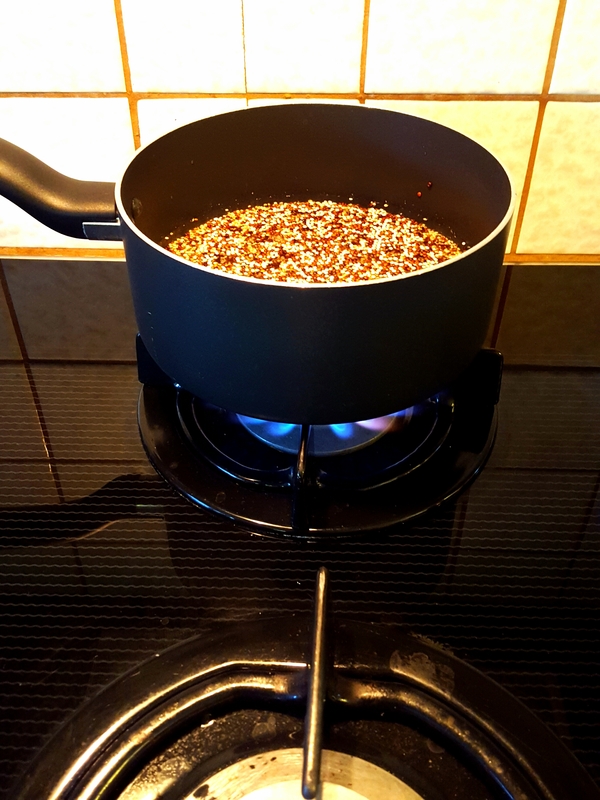 By then, the quinoa was off the stove and cooling off. 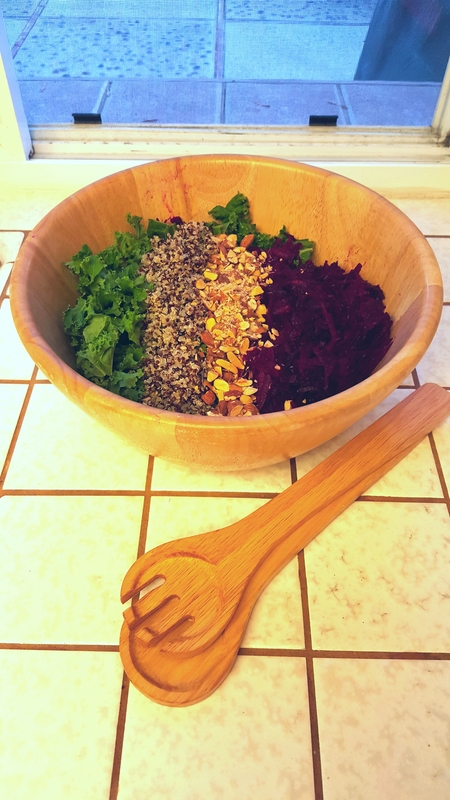 I chopped up about 1/2 cup dry-roasted, lightly salted almonds and grabbed my wooden salad bowl. 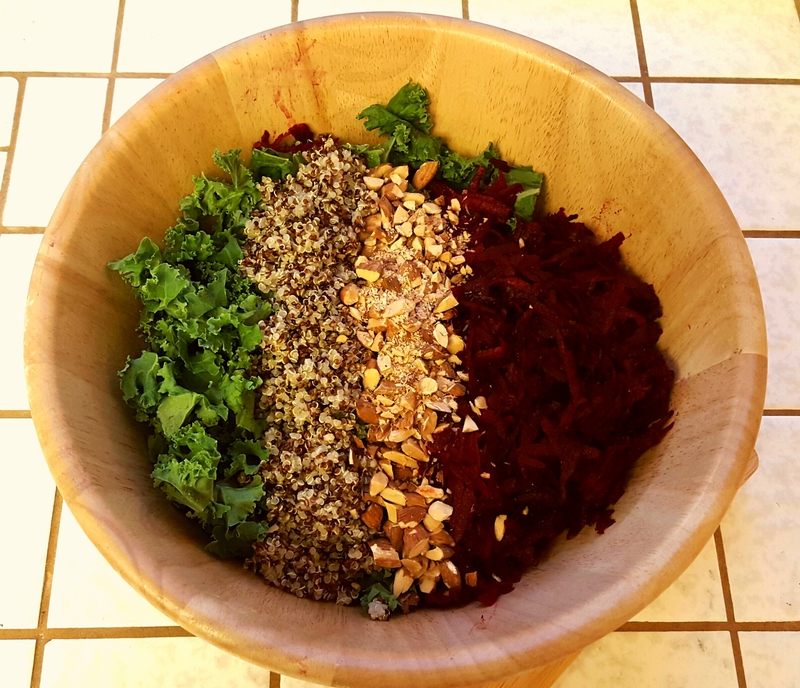 In that bowl I measured out approximately 5 cups kale, 1 cup quinoa, all the shredded beets, and the almonds. Then, I measured out 1 cup of the chilled Green Goddess dressing, tossed the salad, and there ya go. Is it wrong that I get a strange pleasure from serving my innocent family a vegan dinner? A cool and filling vegan meal for a hot summer day. Combine all ingredients, toss, and serve. 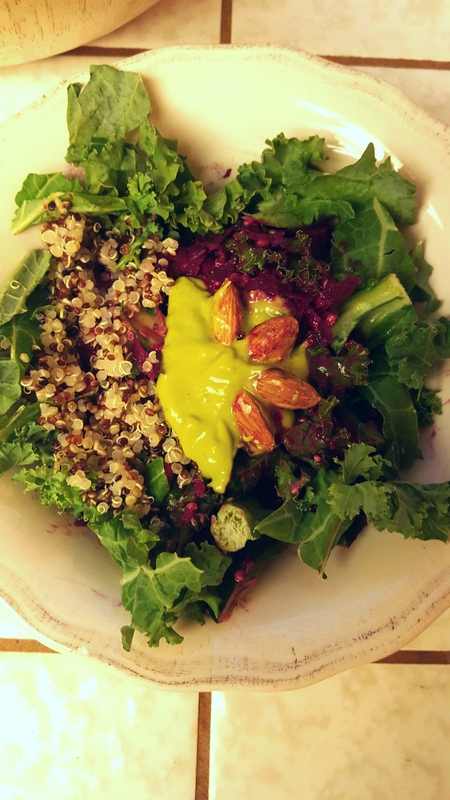 Adapted from the Green Goddess Dressing recipe from Kara Lydon, R.D. Combine all ingredients in a blender or food processor, pulse until smooth. Keep refrigerated to store for later use; if it separates, simply stir, shake in a bottle, or throw back in the blender.